Rhino Safari Camp - Kariba Accommodation. Rhino Lodge is situated on the shores of Lake Kariba, a massive man made lake formed by the damming of the mighty Zambezi River in the late 1950's. 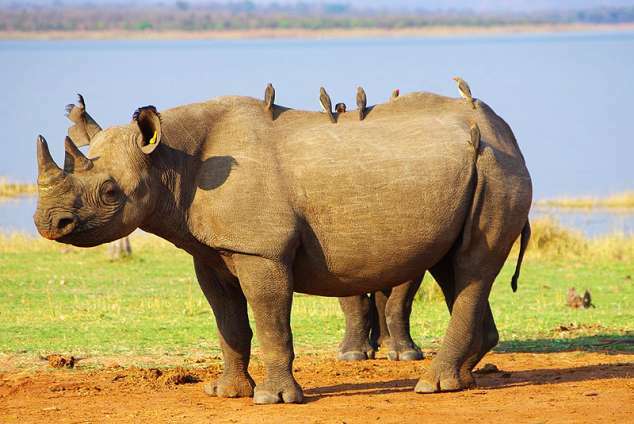 It is also situated within the Matusadona National Park, a remote wilderness area which has been designated as an Intensive Protection Zone for a small but successful population of the endangered black rhino. Situated on Elephant Point on the shores of Lake Kariba within the Matusadona National Park. Accommodates a maximum of fourteen people in seven twin bedded rooms. Regret no children under 12 years of age unless by special request. Each room has en suite open air shower, flush toilet and hand basin. Camp routine revolves around game viewing activities. Game drives combined with walks/tracking of the big five and sunset cruises along the shoreline. All activities undertaken with a Professional Guide. All meals freshly prepared at camp incorporating plenty of fresh vegetables and salads. Recharging of camera and cell phone batteries with a solar powered inverter system. SEASONS: Best game viewing May to October. Best fishing time : Rains November to April CAMP IS OPEN ALL YEAR. Please note we are in a malaria area, it is wise to consult your health care provider about anti-malarial treatments prior to travelling. As at 2nd May 2010 , subject to change as things do in Africa. Unfortunately Air Zimbabwe do not operate regular scheduled flights that service Kariba. Flights from Johannesburg to Victoria Falls operate on a daily basis. A stop in Victoria Falls to view the majesty of the Zambezi at this point is definitely recommended. From here, daily flights are offered to Bumi Hills airstrip, from which Rhino Safari Camp will collect you by speed boat and take you across the mouth of the Ume River to the camp. Reservations for this can be made with us. All charter flights and speed boat transfers have luggage limitations of 10kg per person packed in a soft bag. Left Luggage facilities are normally available at Victoria Falls Airport. Alternatively, a charter flight can be arranged from Victoria Falls to either Bumi Hills or the airstrip at the Ume Crocodile Farm, know alternatively as Rhokari or Kiplings. From the latter there is a short walk to the harbour, and again a twenty minute speed boat transfer to Rhino Safari Camp, across the mouth of the Ume River, into the Matusadona National Park. An alternative routing for visitors to Kariba is to consider a flight via Lusaka and ground transfer from Lusaka to Kariba. This can often necessitate a nights, accommodation in Lusaka on the way in to and out of Zambia, and particular attention should be paid to the time scales involved in crossing international borders, and travelling on roads that are used by heavy duty trucks. Visa costs should also be looked into as you are now involving a third country. But if part of your itinerary is based in Zambia this could be an option to consider. Alternatively we offer speed boat transfers to guests from Kariba town. This transfer takes between one and one and a half hours, and departs from Andora Harbour, our meeting point being Blue Water Charters. Arrangements for this transfer can be made when making your booking. The waters of Lake Kariba are almost without exception rough in the mornings, and thus we prefer to depart from the harbours and operate transfers after approximately 10.00am. This should be remembered for consideration when planning itineraries , we cannot guarantee the length of time that the longer transfers will take, or whether or not guests will arrive in Kariba dry, if we transfer them early in the morning. We can also make arrangements for houseboat transfers from Kariba to camp return. These take approximately five hours, but are an enjoyable way for guests to relax and unwind on their way to us. Light lunch and cash bar are normally offered on these transfers. This is the ideal option with bigger groups of ten to fourteen people, particularly if they are on longer itineraries and carrying more luggage than our recommended 10kg. Given the logistics of transfers, we recommend a three to five night stay. The first and last days can be gobbled up by transfers in and out of the Matusadona area, and it is always wise to have a few extra hours of daylight rather than trying to meet an impossible early morning deadline a long way away. Please note this information is given with the intention of offering different travel options to people who may find it difficult to access information on the area. It is based on personal first- hand experience of the existing conditions. Please take time to verify and update information when making bookings. The camp can also be accessed by road in the dry season, although it is recommended that this is done in 4 x 4 vehicles ONLY. The dirt road runs from Karoi to just short of Binga, and is well sign posted. The 70 kilometres from the turn off into the park and to the camp cross many rivers which do not have bridges and which flood in the rainy season. If you are keen on 4x4 driving off the beaten track, this is definitely an adventure and experience not to be missed. Directions are available on request. Detail description : It is on the shores of Lake Kariba, within the remote Matusadona National Park offering professionally guided game viewing activities which include bush walks, drives, boat cruises and fishing. 5109 page views since 11 May, 2010.